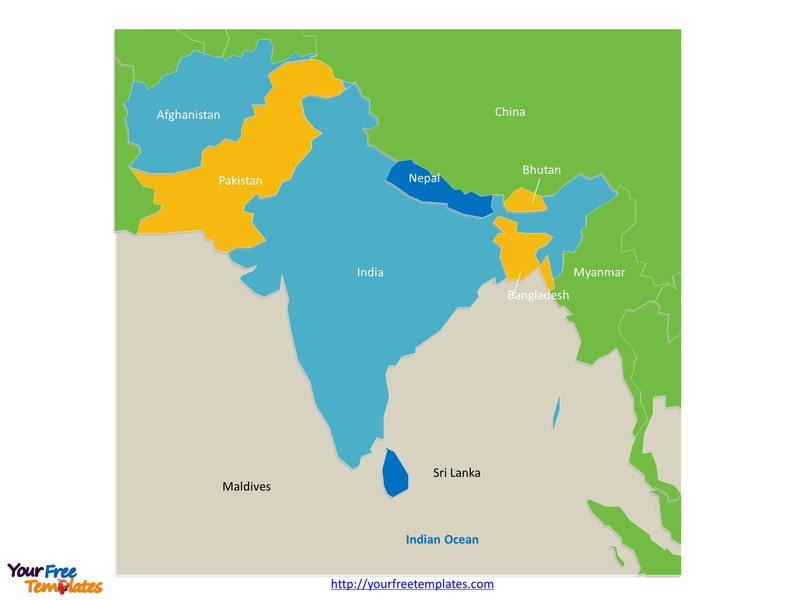 The Map of South Asia Template in PowerPoint format includes three slides, that is, the South Asia outline map and South Asia blank political map, and political map. Firstly, our South Asia map free templates have major capital cities on it. 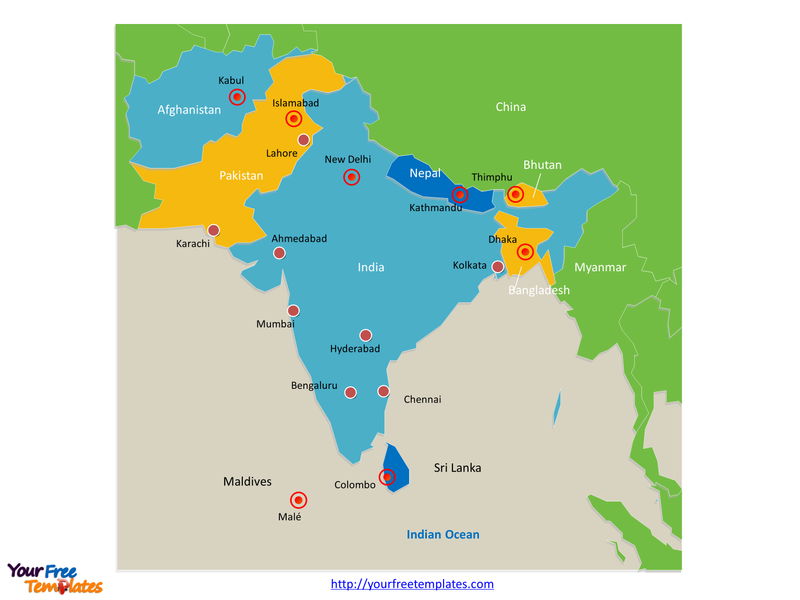 Secondly, there are 8 countries in our South Asia map free templates. The South Asia Map Template includes three slides. Our Map of South Asia is for the southern region of the Asian continent, which comprises the sub-Himalayan SAARC countries. Firstly It is noted that the Map of South Asia is the country political division of there are 8 countries. Secondly they are Afghanistan, Bangladesh, Bhutan, Maldives, Nepal, India, Pakistan, and Sri Lanka. Thirdly it also has the largest population of Muslims in the Asia-Pacific region, as well as over 35 million Christians and 25 million Buddhists. Finally South Asia is bounded on the south by the Indian Ocean and on land (clockwise, from west) by West Asia, Central Asia, East Asia, and Southeast Asia. South Asia map is dotting with national capitals, Kabul, Dhaka, Thimphu, New Delhi, Malé, Kathmandu, Islamabad, and Colombo. The major cities in South Asia are including Delhi, Karachi, Mumbai, and Dhaka. Other populated cities are Kolkata, Lahore, Bengaluru, Chennai, Hyderabad, and Ahmedabad. 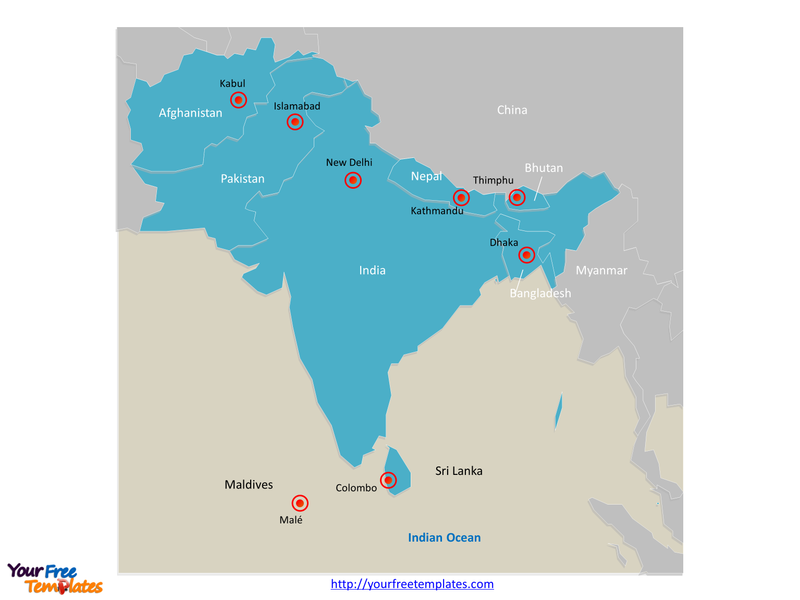 You can found them in our South Asia map free templates. In a word, you can change the texts, colors, sizes, highlight some map shapes, and add your charts. At the same time you can also refer to the fully labeled Map of South Asia in Wikipedia. The most important of all, analysts from marketing research companies, consultants from professional firms think highly of our website yourfreetemplates.com. 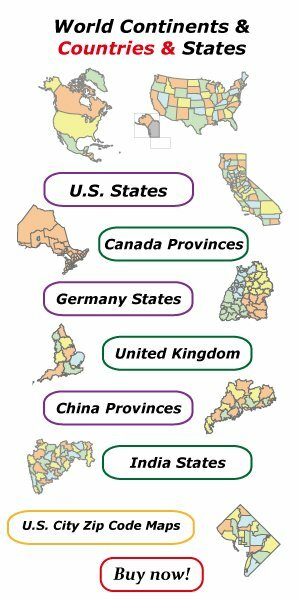 Because our maps can help them reduce their efforts and create attractive maps.